Location technology is entering ever more deeply into our day-to-day lives. Growing market demand for location-based services (LBS) revolves the single premise: “Location everywhere, any time.” The requirement for seamless, ubiquitous positioning includes, of course, urban and indoor environments. Meeting this requirement will provide the cornerstone for a real “boom” in the location market. To realize the capability, location technology seems to evolve naturally towards the aggregation of several systems used in combination to provide accurate information to users. 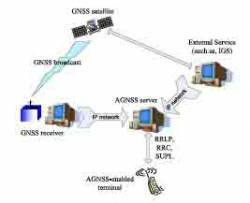 Already today one can see the pre-eminent place of assisted GPS or AGPS, which is no more than a way of combining telecommunication signals with GPS signals in order to improve real-time positioning capabilities. Many mobile handsets equipped with AGPS are now available and standardization played a great role in this beginning success story. With the arrival of Galileo and the near-term prospect for implementation of assisted GNSS (AGNSS) receivers, the market is about to pass through a new technological gap in the location solutions offered by mobile communication systems. . . The central place that standardization could play in the development of the location market was recognized very early in the Galileo program. This was strongly relayed by the industrial participants that merged their competencies and energy to build a new, very efficient location standard around AGNSS. This industrial cooperation — tangibly achieved within 3GPP and OMA — brought Galileo and the GNSS concept into the heart of the location market. Even more, the achievement by all the private companies involved in the process gave birth to what we could call the first real and tangible AGNSS concept, gathering and standardizing the use of several constellations together to improve location performance, a concept in which EGNOS is already demonstrating great advantage. The work continues to add attractive features to the AGNSS standard that ensure even higher performance in mass-market LBS applications. On the one hand, the companies and organizations involved in this process will have to follow the development of communication technologies and, on the other hand, to support the growth of the GNSS concept with the interoperable integration of the future satellites navigation systems. Additionally, an even deeper hybridization of Galileo and GNSS with other technologies will have to be standardized in order to tackle the next challenge: providing accurate locations deep indoors. In parallel, standardization bodies will also have to tackle the challenge of developing test procedures of new AGNSS (or A-GANSS) location technologies, e.g. minimum performance standards, in order to make the feature really usable. Nonetheless, the success already achieved in 3GPP and OMA has established an ideal basis and framework for the development of the mass market for location services, starting from the mobile communications domain but also certainly providing an ideal technological basis for other domains such as intelligent transport systems. To read the rest of Michel Monerrat‘s article, including figures, charts, and graphs, please download the PDF of the entire article above.